I'm often asked why I start my plants from seeds instead of buying transplants. There are a number of reasons, which I will divulge as well as explaining several easy steps to seed starting including the when and how to start seeds as well as problems to watch for. Many garden centers or big box stores have a limited selection of plants to choose from. Browse through any seed catalog and you'll find many selections to choose from. For example tomato plants have a wide range of maturity dates. Those are the length of time between transplanting into the garden and when to expect the first harvest. With a little planning, you can harvest tomatoes anywhere between 50 days up to 100 days, thus providing you with fruits for most of the growing season. Start your own organic seeds and you can be sure that your plants have been raised organically from start to finish. Once you experience the satisfaction of watching a seed the size of a pinhead develop into a plant that produces many pounds of vegetables is reason enough. The first step is to determine what you want to plant. If you don't already receive seed catalogs I suggest that you take a look at The Garden Watchdog and order several catalogs. A couple of my favorites are Johnny's Selected seeds and Baker Creek Heirloom seeds. After you make your selections, order early. Many companies sell out of popular varieties early in the season. After receiving your seeds, read the package carefully - it contains a wealth of information such as germination time and temperatures as well as proper spacing in the garden. How to start them indoors. The next step is to give some of your seeds a headstart by planting them indoors. You can use a very simple setup or a more elaborate one; it's up to you. You'll need containers, a medium in which to plant, heat and lights. You can buy cell packs and flats or recycle containers that you have around the house. The most important thing is that you have adequate drainage no matter what container you use. If using margarine or yogurt containers punch several holes in the bottom. I personally prefer to use 4 packs in a flat covered with a clear plastic dome. 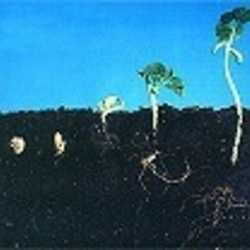 You need to use a soilless seed starting mix. 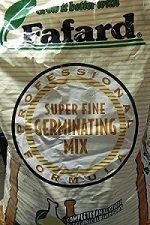 These mixes usually consist of some type of shredded bark, peat and either pearlite or vermiculate. They are much lighter than garden soil and allow sufficient air to the tender roots as they develop. Most seeds germinate best at temperatures between 70-80 degrees F. If you're just doing a few seeds, you can usually get by with placing them in a warm location such as on top of the refrigerator. Heat mats are available from many garden supply companies. 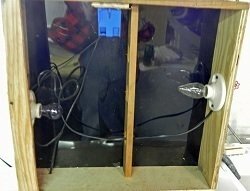 I built a germinating heat box from plans in an Organic Gardening magazine I found in the '70s. It cost almost nothing as I made it from scrap materials I had in the workshop. It holds 2 flats and the heat comes from two 25-watt light bulbs. It has served me well for many years. 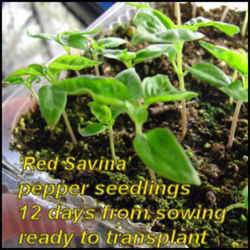 Seedlings don't have to stay as warm as germinating seeds, so move them away from the heat as soon they have germinated. As soon as the seeds germinate they need to go under lights. Again you can start simple and build your way up to an elaborate setup. 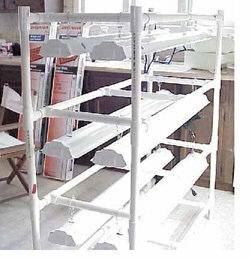 Here's a link to an inexpensive stand made from PVC pipe. I built one of these and used it for a number of years. You can begin with a setup as simple as a table and a shoplight hung over it. With any setup, hang the light from chains so you can adjust it as the plants grow. When the seeds germinate, place the light two inches above the seedlings. Plug the light into a timer so that it's on at least 12 hours per day. As your plants grow, raise the lights so they are just above (but not touching) the plants. There's no need to buy expensive "grow light" bulbs. I use one warm white and one cool white bulb in a shop light fixture and they work just fine. They provide a full spectrum of light for most home growers. Manufacturers have also introduced some new fluorescent bulbs labeled as "sunlight" or "daylight" that work well also. The most common mistake made by new gardeners is to plant too early. When you do this, the plants tend to get "leggy" or tall and spindly. The best way to calculate your start date is to read the seed packet and determine the days to maturity. Count backwards from the last frost date in your area and start your seeds. For example I live in zone 5B. My last frost date is around May 15. I count backwards and usually start my tomato seeds around March 1, which gives me 75 days. I could wait a little longer but I prefer to have larger transplants. 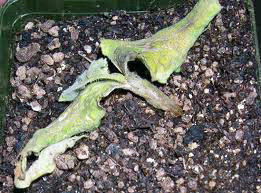 Before you plant your seedlings into the garden, you need to toughen them up - a process called "hardening off." About a week before the plants are to go outside, start acclimating them to the harsh conditions of the big world. On a warm spring day move the containers to a shaded, protected area, such as a porch or deck for a few hours. Each day, unless the weather is bad gradually increase the plants exposure to sun and wind. At the end of the week, leave them out overnight then transplant them into the garden. 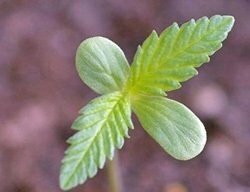 Next to starting seeds too early, the most common problem encountered when starting seeds is a condition called "damping off. This is a general name for fungal diseases that kill newly emerged seedlings. The best way to combat this condition is to use high quality starting mix. If you are reusing containers, be sure they have been thoroughly washed and sterilized in a 10% bleach solution. I like to have a fan directed on my plants 4-5 hours per day to aid in air circulation. Don't keep the soil too moist; let the surface dry before watering. Watering or misting seedlings with weekly with a solution of one tablespoon of hydrogen peroxide per quart of water is sufficient. Remember above all: pick seeds you'll enjoy growing and eating from, have fun and good luck starting your seeds!